You are here: Home / DIY / Food Projects / Fruit Smoothie – Yum, Yum! 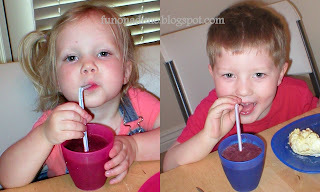 Fruit Smoothie – Yum, Yum! The weather is getting warmer (and staying warmer, no snow again here! ), the trees are getting greener and there are a ton of strawberries at the store! I love warm weather for many reasons, but one of my favorite reasons is because it means that we get to have our favorite treat everyday, if we wanted to. There is nothing better than a cold fruit smoothie made from fresh (or frozen) fruit on a warm day. Yum! It also makes me feel like a better mom because my kids are getting in more fruits and veggies. Yes, I said veggies! I love to add spinach to our smoothies. It does not change the taste and it is good for you. The best of both worlds! Another reason I love to make smoothies so much is because my children really enjoy helping make them, too, making it a really easy and rewarding activity! Here is how we make ours and I’ll explain the veggies further down. Add a handful of strawberries (usually ends up about 6 strawberries), add 1-2 handfuls any additional berries you are adding, add 1 medium sized banana, and 1 handful of spinach leaves. Then add about 1/4 cup of orange juice concentrate (1 cup if not concentrate). If your berries are fresh, add 1/2 to 1 cup ice cubes to the mix that way you can make sure your smoothie is cool, otherwise add 1/2 to 3/4 cups water. I eye this and aim for 3x what I added of the concentrate. Make sure you taste it before you start handing it out and that it does not taste too sweet or too blah! Sometimes I have to add a few more strawberries or another banana. If you want it to be thicker, add more ice cubes. I usually have to do this when I use fresh fruit! If you want it to go further than the 5 or 6 cups without having to use anymore berries, add a banana and add more ice/water (and sometimes a little more juice). I was able to get a good 4 or 5 more glasses out of it! And adding a straw seems to make it that much more enjoyable to drink! Mmmmm! P.S. I like using frozen spinach just because I do not have to worry about the fresh stuff dying if it is not used fast enough. Instead of adding juice/water, add a small container of yogurt – different flavors give it a different twist. Add milk or ice/water to thin it out. And the list could go on and on, but I will let you get creative! Other Tips: I find that the frozen fruit is more affordable when I buy a large bag of it from Costco vs. my local grocery store or even Wal-Mart. Now go treat your taste buds! Ohhh yummy! I never thought to add spinach to it! Great idea. I agree – Costco frozen fruit is better priced and better quality than anywhere else. We just went there in Vegas yesterday. This month's coupon book has some good ones! Go check it out. I'll stay home with your kids while they make smoothies for me 😉 Double the spinach!